Striking watch designs and motifs that celebrate the Modern Indian woman! 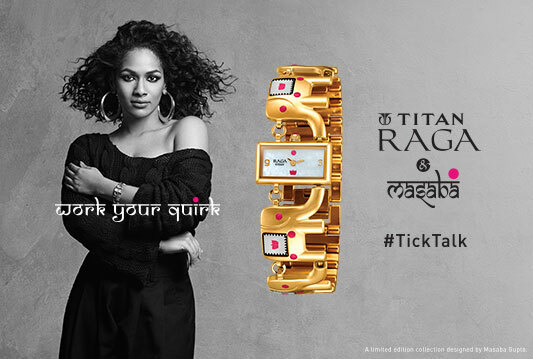 November 9, 2017: Titan Company Limited, India’s leading lifestyle company, unveiled its latest Limited-Edition Collection under the Raga series with designer Masaba Gupta. The Titan Raga-Masaba Limited Edition Collection was launched at the Taj Land’s End with a grand fashion show and unveil that showcased the watches and statement motifs. Priced between INR 7995 to 14995, the collection features 11 statement pieces, each crafting and reinterpreting a unique Masaba Motif into a unique timepiece. In ‘Tribal Hug’, an engraved tribal pillar spirals the wrist for an inimitable wrap watch. In ‘Wanderer Elephant’, artfully cast elephant links in antique finish form the perfect bracelet. In ‘Swaying Fishes’, intricately carved fish charms dangle over a mesh bracelet. In ‘Wishing star’, stars shoot out of a brushed gold bangle bracelet. These unique construction pieces borrow from the techniques and finishing of fine Jewellery, with Brushed Gold, Antique Gold and Rose Gold finishes, the creative use of mesh and elegant enamel work. The Titan Raga-Masaba Limited Edition Collection is a symbol of individuality, designed by and for the woman who believes in her femininity and makes it her power. Titan Company Limited, (earlier known as Titan Industries Limited), a joint venture between the Tamil Nadu Industrial Development Corporation (TIDCO) and Tata Group, commenced its operations in 1987 under the name Titan Watches Limited. In 1994, Titan diversified into Jewellery and subsequently into Eyewear with Titan Eyeplus. In 2013, Titan entered the Fragrances segment with SKINN. Today, Titan Company Limited, India’s unchallenged leader in Watches, Jewellery and Eyewear, is credited with changing the face of all these industries. The financial year 2016-17 achieved an income of 14.5%. Further the company reported a 43% income and profit growth for the April- June 2017 quarter.